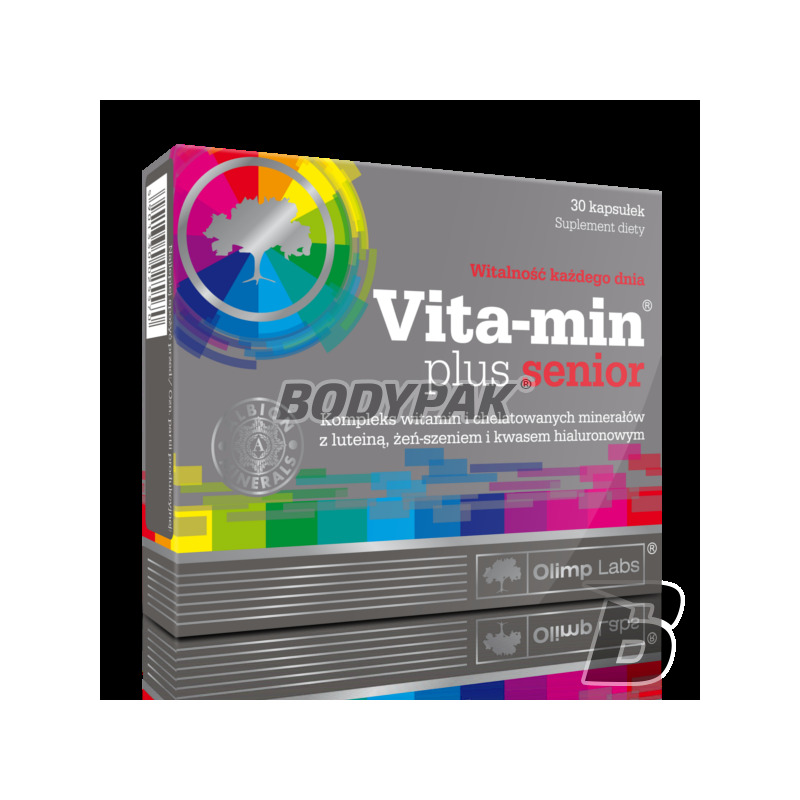 Vitamins & MineralsOlimp Vita-Min Plus Senior - 30 kaps. 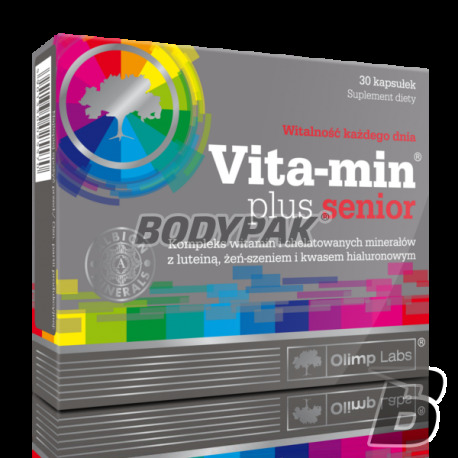 Olimp Vita-Min Plus Senior - 30 kaps. Vita-min plus ® senior is a complex composition of vitamins and highly digestible chelated minerals ALBION - designed for the elderly - easy to cover the basic needs of indispensable micronutrients, enriched with lutein, occurring mainly in the macula of the eye, important for proper vision, extract of Korean ginseng improves the condition of the body, and hyaluronic acid is important for proper functioning of joints. Why Vita-min plus ® senior is especially recommended for elderly people? As age progresses the demand for certain nutrients. In addition, during the aging process, as well as diseases or medicines a reduction in the efficiency of absorption and utilization of certain vitamins and minerals. This can lead to a deficiency of micro-nutrients, necessary for the proper functioning of the body. Their insufficient dietary intake favors weakening available psychophysical, deterioration of well-being and health, increases the risk of diseases of civilization. Therefore, care should be taken with proper supplementation of these components, especially in the elderly. What are the benefits of using Vita-min plus ® senior? Components of the preparation multidirectional support the functioning of the body. What Vita-min plus ® senior stands out from other vitamin and mineral supplements? Minerals contained in the Vita-min plus ® senior exist m. In. in a highly absorbable amino acid chelates and salts of organic acids, which are produced by the leader of the pharmaceutical market of mineral resources - American company ALBION. In this form micronutrients well absorbed from the gastrointestinal tract are completely safe dosage, they do not irritate the stomach, and their possible excess chelate easily leave the body further impede the absorption of other minerals. It is worth noting that the correct structure of the amino acid chelates ALBION been scientifically confirmed with patented method FT-IR TRAACS ®. Note: The concomitant use of other drugs vitamin - mineral and / or drugs you should consult with your doctor. 1 capsule once a day after the main meal with plenty of water.